With an artistic heritage dating back to Etruscan times, Rome is one of the world’s great art cities. Throughout history, it has played a starring role in the major upheavals of Western art and the results are there for all to see – amazing classical statues, stunning Renaissance frescoes, breathtaking baroque churches. Walk around the center and even without trying you’ll come across masterpieces by the greats of the artistic pantheon – sculptures by Michelangelo, paintings by Caravaggio, frescoes by Raphael, fountains by Bernini. In Rome, art is not locked away from view, it’s quite literally all around you. For much of its history Rome has been at the centre of world events, first, as caput mundi (capital of the world), the fearsome hub of the Roman Empire, then for centuries as the seat of papal power. It was a city that counted and this is writ large on its historic streets - martial ruins recall ancient glories, stately palazzi evoke Renaissance intrigue, towering basilicas testify to artistic genius and papal ambition. Elsewhere, underground temples, buried houses and maddonelle (roadside shrines) tell of past lives and local beliefs. 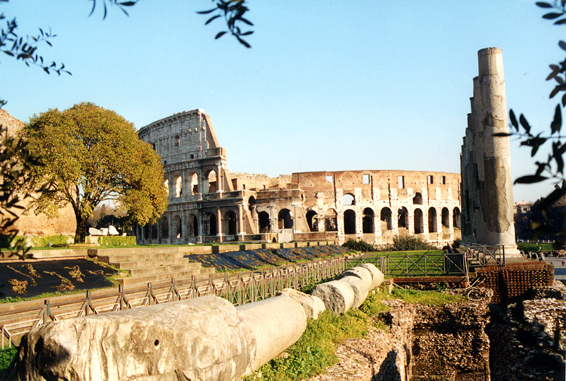 A trip to Rome is as much about lapping up the lifestyle as it is gorging on art and historic sights. And there’s no better way of getting into the local spirit of things than by eating and drinking well. Food and wine are central to Roman social life and the hundreds of pizzerias, trattorias, restaurants and gelaterie that crowd the city centre do as much business catering to locals as to tourists and out-of-towners. Do as the Romans do, says the proverb, and there’s nothing more Roman than enjoying a tasty wood-fired pizza in a packed pizzeria or dining al fresco on a glorious city-centre piazza. Study the lives of early church holy women along with Dr. Kimberly Majeski in the eternal city of Rome! This custom tour is a once in a lifetime opportunity to experience up close and personally the stories and sites of the early Christian era. Excursions to gorgeous Ostia Antica and epic Pompeii! Saturday, August 6 : Arrive at four star hotel in the heart of the city. The group will meet this evening all together for a quick orientation and devotion before an early restful night. Sunday, August 7 : In the morning, we'll take a half day tour of the Vatican Museum and St. Peter’s Basilica, talking along the way of the women who have impacted our faith through the Roman Catholic tradition. We'll also have an overview of the layout of the city. In the afternoon, we'll have some free time to rest at the hotel or explore the city on our own a little bit, depending on how the jetlag is affecting each of us. Monday, August 8 : Today we'll have a full day tour of San Clemente, the Colosseum & Forum, Saint Peter in Chains, and the ancient Roman Catacombs. This day will include a fair amount of walking as we'll see a lot of the city. Tuesday, August 9 : Now that we'll have a good feel for the way the city is laid out, we'll have a full day free to explore on our own. Kimberly will lead a group of whoever wants to go, to shop some of the smaller boutique stores and souvenir shops, sit and enjoy a relaxing cappuccino while watching the people pass by, and take a moment to remember all that we've seen so far. Wednesday, August 10 : In the morning, we'll board a deluxe motorcoach for a full day trip to ancient Pompeii, famously destroyed during a volcanic eruption of Mt Vesuvius in 79 AD. A fully guided tour of this well-preserved site will give us a sense of how women in the ancient world really lived. We'll return to our hotel in Rome this evening and have dinner in the city. Thursday, August 11 : Today, we'll have another bigger walking day, with a walking tour of Navona Square, the Pantheon, and the Trevi fountain. In the late morning, we'll have a true Italian cooking class, after which we'll eat the delicious food we've prepared! The afternoon is free for last souvenir shopping and some rest after the walking tour. Friday, August 12 : We'll board the bus again today to take a day trip to visit the ancient city on the water: Ostia Antica. We'll connect the dots with all the things we've seen along the way and have final moments together before returning to our hotel in Rome. Register before May 20, 2015 with a fully refundable $500 deposit and save $100 off the trip cost. Space is limited. Registrations for Kimberly's trips fill-up quickly; register today! Estimated $2,500 plus round trip airfare - includes half board, lodging, guides, entrance fees, ground transportation. Details to be confirmed. For more information or make a deposit, contact, Allison Suer at Church of God Ministries, (765) 648-2161.